​I grew up in the Pacific Northwest, which means that salmon has long been a staple of my diet. 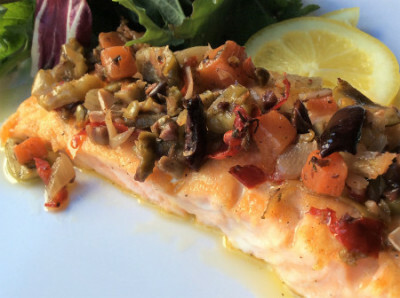 This baked salmon dish is a family favorite. The richness of the salmon pairs exceptionally well with the bright, acidic, and briny tapenade. Even better, it’s basically a one-pan meal -- you use the same dish to make the tapenade, sauce, and bake the salmon. 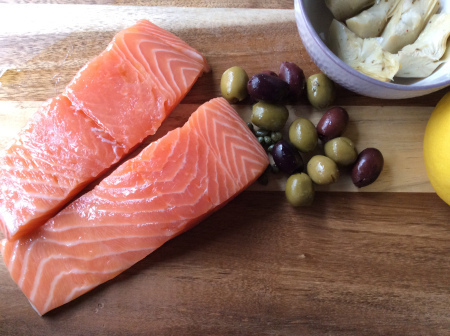 Salmon: Place the flour into a shallow bowl or pie plate and dredge each of the salmon fillets in in the flour. Heat medium stainless steel frying pan over medium heat with 2 tbsp olive oil. Add salmon and cook 2 minutes on each side, it won’t cook through, but that’s ok, it’ll finish cooking in the oven. Add a pinch of salt and pepper to the top of the salmon while it cooks. Remove the salmon from the frying pan, and set aside to let rest. Tapenade: Use the same pan you cooked the salmon in, adding a little more oil if it seems dry. Add the carrots and onions, and let them cook for 5 minutes -- keep the heat at medium, you are not trying to brown the vegetables, just soften them. Add garlic and continue to cook for 1 minute. Add the olives, artichokes, and capers and give it a quick stir before removing from the heat. Let the tapenade mixture cool. Once it is cooled, pulse in a food processor 8 - 10 times. Finishing:. Set oven to broil. Place the salmon back into the frying pan that you used for the tapenade. Spoon 3 tbsp tapenade on to each fillet. Drizzle remaining olive oil on each fillet. Place the frying pan in the middle rack of the oven, and cook for 2 minutes. Keep the salmon in the oven, but turn the oven to 375 degrees and let salmon bake in the oven for 6 mins. Turn the oven off and leave salmon in the oven for 2 mins. Carefully remove the pan from the oven, and place the salmon on a serving dish. Don’t get rid of your pan! Place the pan back on the stove on medium heat. Add the juice of half a lemon and cook for 1 minute. Add basil, ¼ cup white wine and salt and pepper to taste. Cook down for 1 minute. Spoon the wine wine sauce on both sides of the salmon fillet.